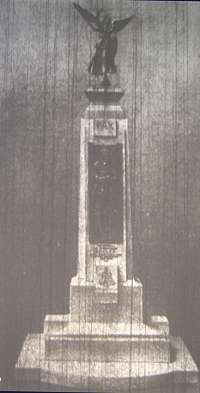 The design model - picture from a badly-scratched microfilm of the Eccles and Patricroft Journal. 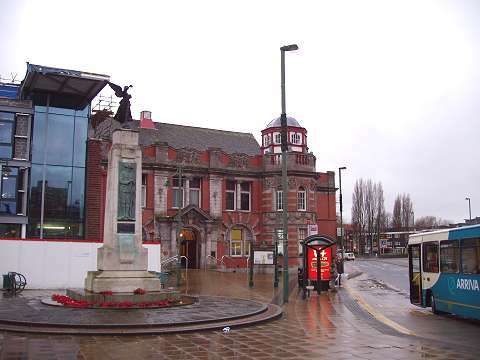 Eccles is an ancient market town which in 1974 found itself incorporated into the borough of Salford in Greater Manchester. The town grew around St Mary's Parish Church, from which the town got its very name: As the Church's own history website tells us: 'The name Eccles is derived from the Primitive Welsh word itself borrowed from the Latin “Ecclesia” and meaning 'a church'. Primitive Welsh is the form of the Celtic language which the Anglo-Saxons met when they first settled here and this would suggest that there was a church in this area even before the Saxons arrived.' The church as it stands today incorporates parts of a building erected in Norman times; its graveyard was converted in the 1960s into a pleasant garden, although a few graves, including that of Robert Stephenson (Brother of George, and uncle to more famous railway-builder Robert) have been retained. Eccles station lies on the Liverpool and Manchester line, opened in 1830 and the world's first inter-city railway. The town regained its reputation for rail novelties when the new branch of the Manchester Metrolink light rail system opened to a terminus near the memorial in July 2000. This new transport link has, it would appear, given something of a boost to the town, although the town centre shopping precinct dating from the 1960s now has a depressing air, as shoppers have been lured away by new large stores nearby and the huge Trafford Centre development which is within easy reach. The name of the town is probably best known for the Eccles Cake, a creation of currants in puff pastry, which seems to have originated there in the eighteenth century. Such traditional delights have lost some of their popularity recently in favour of Danish pastries and other foreign ideas, and Bradburn's 'Only Old Original' Eccles cake shop on Church Street, opposite the memorial, was demolished in the 1960s, but I am pleased to say that when I visited to take these pictures on a dreary January day in January 2008 I was able to enjoy one with a cup of tea in the café of the Morrison's supermarket. 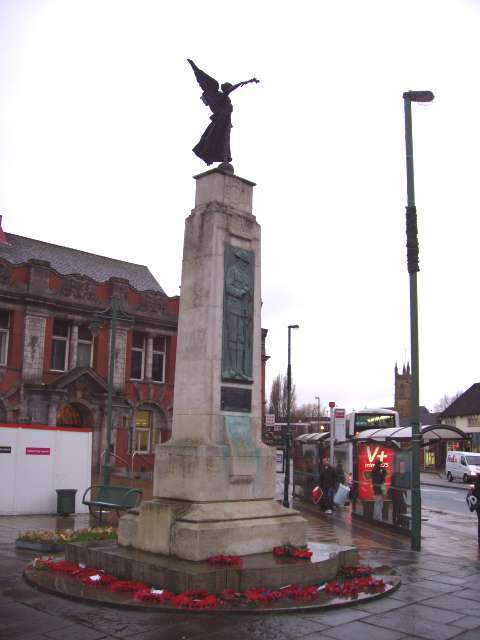 To find the War Memorial, alight from the tram and head straight onward for a short distance along Church Street. A note on "Winged Victory"
The inspiration for this favourite Cassidy memorial motif (see also Skipton) appears to be the Nike of Samothrace, according to Wikipedia 'a third century B.C. 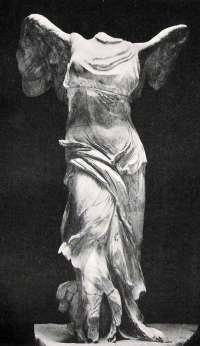 marble sculpture of the Greek goddess Nike (Victory) discovered in 1863 on the Greek island of Samothrace. Since 1884, it has been prominently displayed at the Louvre and is one of the most celebrated sculptures in the world.' The arms and head were never found (and one of the wings is a plaster replica), but even so it has inspired many sculptors, particularly with the handling of the drapery against the flesh. It will be noted that the figure first rose to fame in when Cassidy was a student at the Manchester School of Art. Church Street, Eccles: from village lane to high street, by Helen Wickham and the Local History Group of the University of the Third Age, published by Neil Richardson in 1992: a very interesting book about the area, although with little mention of the memorial. Special thanks to the very helpful staff of the Salford Local History Library which is an Aladdin's Cave for local history fans. 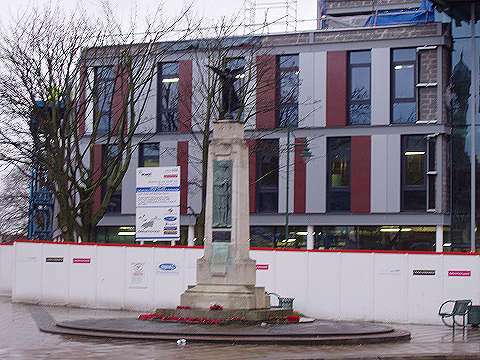 Eccles' principal war memorial to those who died in the First World War was unveiled in 1925. The project for a war memorial for the whole borough, to augments the many local memorials around the town was launched in February 1924. Various ideas for a memorial were discussed - including a bridge across the Manchester Ship Canal and a new peal of bells for the parish church - before it was decided to erect a more conventional war memorial on a site in the centre of the town. This centotaph - a word based on the Greek for 'empty tomb' which came into use for this kind of monument - has served ever since as a focus for the town's Remembrance Day commemorations. The photograph [shown, left] is from the model proposed by the eminent sculptor Mrs John Cassidy, R.B.S. The stone pedestal is to be surmounted by a graceful bronze figure of "Victory" and a a bronze panel representing a soldier will decorate the front. The total heoght of the memorial is to be over 20 feet, and should be a tribute to the fallen of which the borough may be proud. As the whole of the amount involved has not been subscribed, it is earnestly hoped that all who have not done so will take the opportunity of hepling to recognise in visible form their gratitude and remembrance to those who gave their lives. The model will be on exhibition tomorrow (Saturday) at the British Legion hall, where a small charge will be made to help the fund. Commencing at 4.0 pm prompt. ENCLOSURE "A" - for ex-servicemen of the naval, military and air forces. ENCLOSURE "C" - For the nominated relatives of the fallen, and for widows and other dependants taking part in the ceremony. Enclosure "D" - For the orphans and fatherless children of the fallen. Enclosure "B" - Subscribers to the War Memorial Fund. Members of the town council, and other public bodies. Lord Derby's speech and the music by the band and choir will be Amplified by the "Daily Mail" Marconiphone Loud Speaker. During the years of the war the "Journal" recorded the deaths on the battlefield and in hospital of no fewer than 808 men and youths whose homes were in the borough of Eccles and its immediate vicinity, excluding those of Swinton. The unveiling took pace as planned on 15 August 'on one of the finest days of a fine summer, and a great crowd of people assembled.' Pictures in the 21 August Journal show a tramcar picking its was through the crowds, Lord Derby chatting with ex-servicemen, and representatives of the war orphans placing a wreath. Contemporary reports say that the area around the memorial was laid out in york stone and flower beds, but today, sadly, there is no sign of the flower beds, or even the grass circle and small wrought-iron pillars that were there more recently. in what is now a very busy area where people wait for buses and visit the nearby public buildings. 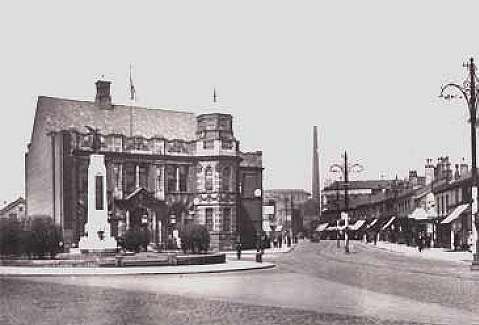 The edifice behind the memorial is Eccles Public Library, one of many across Britain built in the early twentieth century with funds from Andrew Carnegie, a Scostman whih made a fortune in the steel industry. It opened in 1907, and celebrated its centenary with an interesting exhibition which was still there on the day of my visit. Our picture here is from a picture postcard which must date from soon after the creation of the memorial. The shops to the right, in Church Street, have since been replaced - twice - and the cotton mill chimney on the horizon is long gone. About 1970, a single-storey Library extension was built, as shown in this picture; by the 2000s this was in poor condition and a project began to replace it with a new structure which would harmonise with the Carnegie library and include a selection of public facilities. Local Improvement Finance Trust. When it opens in 2008, the centre will house four General Practitioners, a Salford City Council 'One Stop Shop', Eccles children’s library, community rooms and a café. On our visit the building was nearing completion: it features the randomly-arranged panels which has become the architectural fashion of the late 2000s. This memorial turned out to be (as far as we know) Cassidy's last major public work; he was 65 in 1925 and with no more war memorials on order, he seems to have decided to retire. He closed down his Lincoln Grove studio, although he 'kept his hand in' with sculpture in a small way until the day he died in 1939.